Dubai, UAE, December 19, 2018: HTC® has announced the newest addition to its HTC Desire series, the HTC Desire 12s, continuing the trend in the series of affordable, high-quality entry-level smartphones. 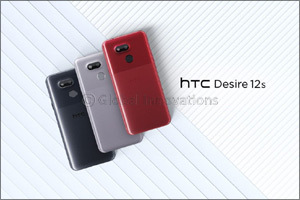 The HTC Desire 12s gives consumers a whole new experience starting with its appearance; its unique striped dual texture design evokes a flagship smartphone feel due to laser engraving, creating a smartphone that is both aesthetically pleasing and comfortable to hold. The HTC Desire 12s offers considerably better specs and functions than its predecessor, which includes 13-megapixel front-facing and rear-facing cameras. Coupled with its tempting price tag of AED 729, the HTC Desire 12s is the best choice consumers can make when buying an entry-level smartphone. Dual-texture design. The unique dual-texture design of HTC Desire 12s incorporates the design concept of HTC's flagship smartphone, with over 120 laser-engraved lines engraved, so both glossy and matte textures can be seen on the back. The elaborately engraved lines offer users an excellent hand feel, not only setting itself apart with its appearance, but also offering excellent comfort when using the smartphone. 13 Megapixel front-facing and rear-facing cameras for taking selfies. The HTC Desire 12s has a 13-megapixel front-facing camera, the highest among all entry-level smartphones. The smartphone has a flashlight for taking bright pictures under dim lights with a built-in immediate skin smoothing effect, allowing users to take gorgeous selfies without needing a third-party app. The main camera also has 13 megapixels with PDAF and large aperture of f/2.0, offering rapid focus and excellent light sensitivity for users to easily record beautiful moments in life at any time, any place. Entry-level price, high-level specs. The HTC Desire 12s comes with a Qualcomm eight core processor with excellent performance and energy efficiency and supports 4G LTE high speed Internet access (with downloads reaching 300 Mbps and uploads reaching 50 Mbps) for users to have a smooth experience playing games or watching videos. The high-level specs and entry-level price as previous products of the HTC Desire series makes the HTC Desire 12s easily affordable for consumers. The HTC Desire 12s comes in two colors: Charcoal Black and Silver, across two versions: 3GB/32GB and 4GB/64GB (available in the second phase) for users to choose from. The recommended price of the 3GB/32GB version is AED 729. The HTC Desire 12s will be available across major consumer electronic stores around UAE starting December 20th and on HTC e-commerce platform at www.htc.com. With our unique striped dual finish design, HTC Desire 12s stands out from the crowd in both looks and feel. This phone sports a big display while being surprisingly light and compact without any compromises on quality. The 5.7”, 18:9 full body display really opens up your view. It’s big and seamless, making it a perfect go-to for watching movies and videos, playing games, checking emails and a whole lot more. Your best self in any occasion. The 13MP selfie camera will delight the selfie enthusiast in you. The front flash makes taking those tricky low light selfies a snap. Look your best with beautification mode even when the conditions or lighting isn’t favorable. Capture bright colors and delicate details. The hi-res 13MP main shooter packs a powerful punch. Fast focus with PDAF gives you the crisp and brilliant details you deserve.